Twenty-six young activists from across the British trade union movement visited Cuba to enjoy the May Day celebrations and offer their solidarity to the Cuban people as part of the Young Trade Unionists May Day Brigade, organised by the Cuba Solidarity Campaign (CSC). Delegates from four trade unions; Unite, UNISON, UCATT and GMB participated in the brigade, representing millions of workers in Britain, who joined trade unionists and political activists from around the world in a programme of cultural activities, visits, entertainment and political discussion. The shift in the US-Cuba relations and the release of the Miami Five were issues central to this year’s brigade, with emphasis on the fact that the blockade is not over. Topics of political discussion included the Cuban political systems, the US and its policy towards Cuba and importance of international solidarity. 240 activists from 20 countries filled the Julio Antonio Mella camp near Havana, where brigadistas carried out early morning agricultural and manual work, including weeding, lifting and cleaning, where they experienced first-hand the struggle of life under the US blockade, which denies the Cubans access to basic machinery and goods. The young activists enjoyed a prime position at the extraordinary May Day Rally Celebrations in Havana, where they were just rows away from Cuban President, Raul Castro, Venezuelan President, Nicolas Maduro and all five of the Miami Five – at the first May Day since their release – who waved onto cheering crowds of nearly 1,000,000 people. Masses of people, as far back as the eye could see, marched under the banner of ‘Unity in the construction of Socialism’; celebrating the achievements of the Cuban Revolution. Chair, Unite EC with Unite young members on the brigade. The heavy rain, unprecedented on May Day, did not dampen the spirits of the delegation of young activists, who danced to the samba band in the rain and enjoyed contributing to the carnival atmosphere at Plaza de Revolucion (Revolution Square), where the huge images of revolutionary heroes Ernesto ‘Che’ Guevara and Camilo Cienfuegos looked over the immense crowd of people. On May 2 the brigadistas attended the International Meeting of Solidarity with Cuba conference at the Conventions Palace in Havana. As international guests of the Confederación de Trabajadores de Cuba (CTC/Cuban TUC equivalent), the brigade gained valuable insight into Cuban trade unionism and their crucial role in the government and economic management of the country. The Conference included distinguished guests Cuban Vice-President Miguel Diaz-Canal, CTC General Secretary, Ulises Guilarte and all of the Miami Five heroes; Gerardo Hernández, René González, Ramón Labañino, Antonio Guerrero and Fernando González. 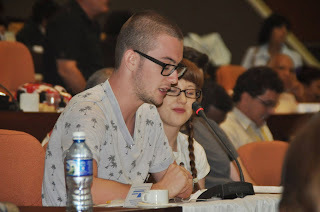 Joe McGurk, from Unite Scotland, delivered an excellent speech on behalf of the delegation to over 2,000 delegates and broadcast on Cuban television, in a speech which sent solidarity to the people of Cuba, called for an end to the US blockade and called on the British government to issue visas for the Miami Five, which received a huge round of applause from the conference. The brigadistas had many visits included in the programme; visits to a local primary school, the Museum of the Revolution in Havana, meeting with local artists, a local CDR (Committees for the Defence of the Revolution) and a survivor from the 1961 US-organised invasion at Bay of Pigs, who read an emotional poem to give an insight into her experience of the invasion. In Santa Clara, the group visited the armoured train - the scene of the Battle of Santa Clara, where Che Guevara’s battalion attacked a train carrying weapons for the US-backed dictator Batista - a key moment in the Cuban Revolution. Following this visit the group paid their respects to the nearby Che Guevara Memorial and each lay a flower in his memory. The brigade offered experiences far beyond that of an average tourist in Cuba, including attending conferences with the CTC and meetings with the leaders of political and mass organisations, such as the Federation of Cuban Women (FMC) and the Committees for the Defence of the Revolution (CDR) alongside many opportunities for interactions with Cubans throughout the programme. In addition to the brigade programme, there was time for fun and relaxation – with lots of music, dancing and entertainment provided by local artists in every town the group visited, and a few Havana Club rum cocktails and Bucanero Cuban beers were enjoyed. The brigade provides the opportunity to see Cuba first-hand, free of capitalist media misrepresentations and to show solidarity with the Cuban people. Conditions on the camp were basic – at times there were power and water cuts – and accommodation was in bunk bed dormitories. Brigadistas braved the Caribbean heat to undertake agricultural work with their Cuban comrades, transported in the back of open trucks. Such experiences give a brief insight into life under an illegal and inhumane blockade which denies ordinary people access to basic resources. For over 50 years Cuba the US tried to isolate Cuba, but ultimately, the US became isolated with its aggressive foreign policy towards the island. Solidarity with Cuba helped win this battle and now it is needed to end the blockade. Whilst Barack Obama has acknowledged that the blockade has been a failure, it still remains in place. Any movement towards ending the blockade is likely to be blocked by the Republican-controlled Congress. Cuba needs solidarity now more than ever as the US goals of regime change are still the same - it’s just a change of tactics taking place. Brigadistas ended the trip with fresh passion and enthusiasm to get more active in their unions and with a commitment to work alongside CSC to redouble efforts to end the blockade once and for all, campaign for the illegally occupied Guantanamo Bay area to be returned to Cuba, defend the achievements of the revolution and defend Cuba’s right to sovereignty and independence. Solidarity helped free the Miami Five. For the people of Cuba, this ongoing support and solidarity is invaluable as we work together to end the blockade. Viva Cuba! Interested in Cuba? Take Action! Affiliate your trade union branch or region to the Cuba Solidarity Campaign.